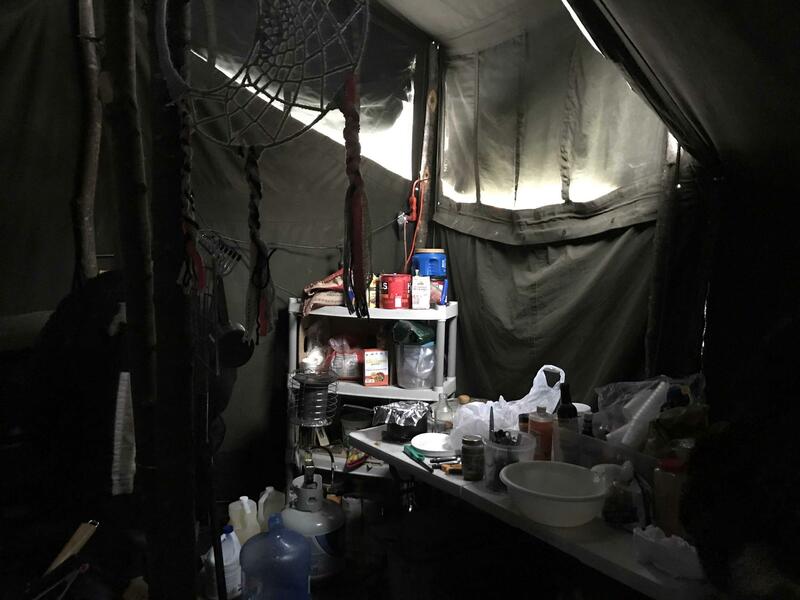 Indigenous activists have been camping in Levering for five months, calling for a shutdown of Enbridge's Line 5 oil pipelines. "We gather around the woodstove now," says Sarah Jo Shomin. Shomin is 22 years old, a formerly enrolled member of the Saginaw Chippewa Indian Tribe. For months, she and others have been camping near Levering, calling for a shutdown of Enbridge’s Line 5 oil pipelines, which run through the Straits of Mackinac. They say the 66-year-old lines are at risk of leaking into the Great Lakes. Enbridge says Line 5 is safe, and a tunnel they’re planning to build will be even safer. But, campers say they are staying until Line 5 is shut down for good. There are 8 permanent residents at the camp, set up on volunteered private property 17 miles south of the Straits of Mackinac. Campers recently trekked the entire distance as a prayer walk. 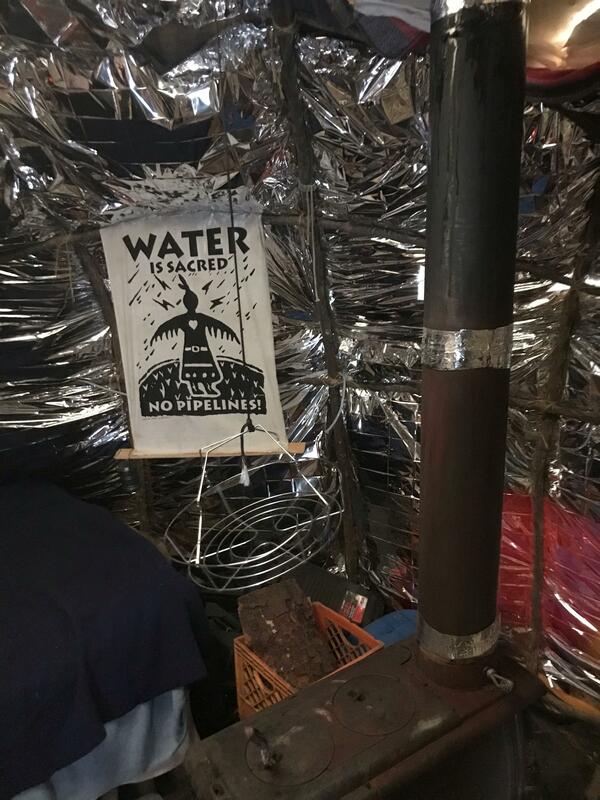 The camp is close to Line 5 protests, public meetings, and rallies. Its very existence is meant to draw attention to the pipelines. Its name, Anishinaabek, translates to "original people", and refers to a group of Indigenous people that includes the Ojibwe, Odawa, and Potawatomi. Shomin was arrested two years ago while opposing the Dakota Access Pipeline at Standing Rock. Now, she's leading anti-pipeline activism on land her family has called home for thousands of years. 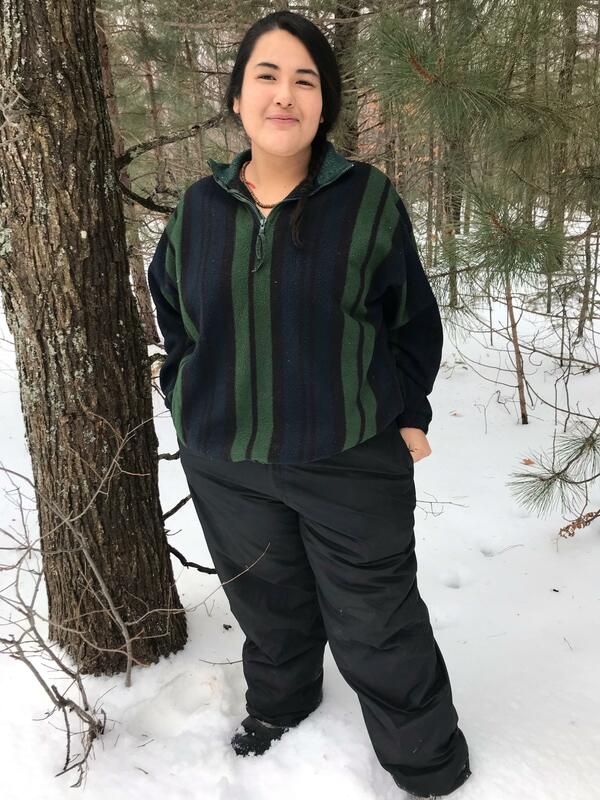 Sarah Jo Shomin, a leader at Camp Anishinaabek, is 22 years old and a formerly enrolled member of the Saginaw Chippewa Indian Tribe. Stopping Line 5 with a camp might seem impossible to some. But, Shomin says her ancestors would want her to try anyways. "They're telling me to fight. Even if you don't win, you fight. Because they fought. They fought so hard for me. They didn't even know me and they were fighting for me, you know? Campers call themselves "water protectors". A water protector is a member of an Indigenous-led movement against oil pipelines. At camps across their traditional territories, in what is now the U.S. and Canada, they gather to stop new pipelines from being built or, in this case, to shut down old ones. In between their activism, campers are just focused on surviving a Northern Michigan winter in the woods. Shomin says most mornings start a little uncomfortably. "Your alarm clock is you get cold," she says. "You wake up because it's cold because your fire went out." The campers go through more than a cord of wood a week. 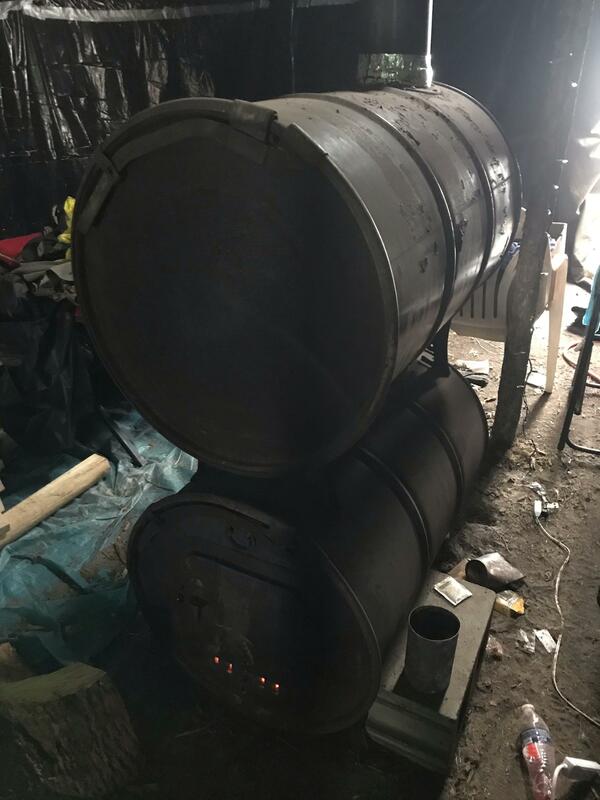 They keep double-barreled woodstoves going all night in the sleeping tents, and 24/7 in their community tent. Their tents are mostly military surplus, but one camper has constructed a wigwam and lined it with specialized materials. Shomin points to a shiny, heat-reflective layer. "Yeah, this is like emergency blankets," she says. "Then, he has blankets underneath the emergency blankets." One camper at Camp Anishinaabek has constructed a traditional wigwam and lined it with emergency blankets. She smacks the walls to beat the snow off and keep the wigwam from collapsing. A lot of time at camp is spent just keeping things going. There’s always a fire to stoke, a structure to reinforce, or donated supplies to organize. Shomin is currently building her own wigwam, painstakingly finding and cutting the right trees. "Like these trees right here; I need about ten more," she says, pointing to a cluster of saplings. "They're really hard to cut down, actually." She's excited by the prospect of learning a traditional building skill, and having her own private place to sleep. Lunches and dinners are communal meals prepared by camp cook, Winona Kasto. She's Lakota, from the Cheyenne River reservation. This isn't her first time at a water protector camp, either. The inside of the kitchen tent at Camp Anishinaabek. "I was at Standing Rock. I was the head cook. I took care of 13 kitchens, made sure that they were up to par to standards, to state standards." Here she runs one kitchen tent, stocked with donated non-perishable food and equipped with a propane stove. Local tribal harvesters bring fish, venison, and more. "Here we eat a lot of wild game, which is nice because that's what I do back home," she says. Then, with a laugh: "I never had raccoon before, these guys they eat raccoon." At one point, Kasto's son appears, holding camp cat Louie, who roams between the tents, chasing chipmunks. He has a cat sister, Zoe, and a pitbull puppy sister, Karma, who greets visitors with tail wags and kisses. And, visitors arrive daily, according to Shomin. A steady stream of people bring food, firewood, expertise and labor. They hang out and sometimes spend the night. A double-barreled woodstove heats one of the sleeping tents at Camp Anishinaabek. "We have a really awesome support system out here," says Shomin. There currently aren't any showers, but generous locals let campers come over and wash up at their homes weekly. Shomin stresses that the camp is more than shutting down Line 5 – it's about the way of life here, with ceremonies, traditional foods, and community. Demonstrators gathered in Petoskey on Saturday, opposing the state's plan to build a tunnel under the Straits of Mackinac, which would house twin oil pipelines owned by Canadian company Enbridge Energy.